What Are the Disadvantages of LASEK Eye Surgery? What Are the Possible Side Effects of LASEK Eye Surgery? How Do I Know If LASEK Eye Surgery Is for Me? What Happens During LASEK Eye Surgery? What Happens After LASEK Eye Surgery? Laser epithelial keratomileusis, or LASEK, combines benefits of the two most commonly performed procedures -- LASIK and PRK. LASEK eye surgery is used to treat astigmatism, nearsightedness, or farsightedness. What Are the Advantages of LASEK Eye Surgery? Complications associated with creating and reattaching the flap in the cornea are avoided. LASEK eye surgery causes dry eye less frequently than LASIK eye surgery. 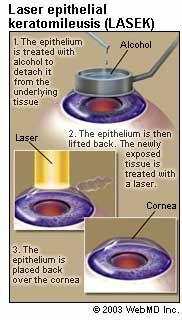 In LASEK eye surgery, various techniques are used to retain the very thin corneal surface layer of cells (epithelium) that is used to recover the cornea after the laser sculpting is performed. With LASIK, a thicker flap is created using a laser or mechanical device (microkeratome) under which the laser sculpting is done. Longer visual recovery time compared to LASIK eye surgery. Many LASEK patients will not fully recover functional vision for at least one to two weeks while their eye heals, which is similar to the healing time experienced in PRK eye surgery. LASIK patients often have good vision by the day after surgery. LASEK eye surgery usually causes more pain and discomfort than LASIK , but possibly less pain than PRK surgery. Patients need to wear a "bandage contact lens" for about three or four days after LASEK eye surgery to serve as a protective layer between your blinking eyelids and the treated eye surface, which is not necessary after LASIK. Patients must use topical steroid drops for several weeks longer than after LASIK eye surgery. In many ways, LASEK is very similar to PRK and added benefits compared to PRK are not clear. LASEK eye surgery may be better for patients who have steep or very thin corneas, which make it difficult for the surgeon to make a proper LASIK flap. Since traumatic injury to the eye is more serious after LASIK than after LASEK eye surgery, patients who engage in professional or leisure activities that put their eyes at increased risk for injury (such as boxing) may be better suited for LASEK. LASEK (or PRK) eye surgery may be better for people with dry eye syndrome because in avoiding a deeper flap, the corneal nerves responsible for the tearing reflex are not cut. Before your LASEK laser eye surgery you will meet with an eye surgeon or a coordinator who will discuss what you should expect during and after the laser eye surgery. During this session your medical history will be evaluated and your eyes will be tested. Likely tests include measuring corneal thickness, refraction, corneal mapping, eye pressure, and pupil dilation. Once you have gone through your evaluation your surgeon will answer any questions you may have. Afterwards, you can schedule an appointment for the procedure. If you wear rigid gas permeable contact lenses, you should not wear them for at least three days before your evaluation. Other types of contact lenses shouldn't be worn for at least three days prior to the evaluation. LASEK eye surgery is done under a topical anesthesia placed directly into the eye. During the procedure, the top layer of cells, or epithelium, is treated with alcohol for about 30 seconds and detached from the underlying tissue. It is then lifted or rolled back so that the eye doctor can access the cornea tissue. The newly exposed tissue is treated with the same laser used in LASIK eye surgery and PRK. Then the top layer of cells is put into place. This is in contrast to LASIK eye surgery, in which a laser or cutting device makes a flap in the cornea. LASEK eye surgery differs from PRK by preserving the top layer of cells, rather than scraping them away and waiting for them to grow back. 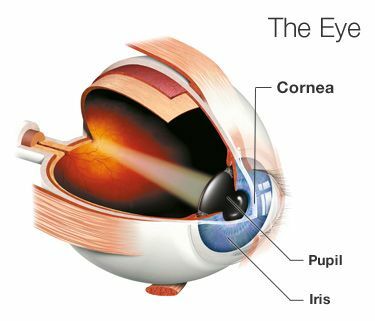 This is believed to facilitate healing of the cornea with less discomfort than PRK, but it also causes more blurriness during the first few days compared to PRK. After LASEK eye surgery, expectations are similar to what can be expected after LASIK. The flap created by LASEK eye surgery heals in about four to seven days, and the patient usually wears a special contact lens that acts as a bandage for up to four days after surgery. Patients also may experience irritation in their eye during the first day or two after LASEK eye surgery. For patients who undergo the LASIK procedure, good vision is usually attained in a few days. However, for LASEK eye surgery this may take as long as a week. You will revisit the doctor for an evaluation the day after LASEK eye surgery, and commonly one week and three months after surgery. If you have any questions after your LASEK eye surgery or if you experience pain, a sudden decrease in vision, red eye(s), or discharge from your eye(s), contact your eye doctor immediately. Council for Refractive Surgery Quality Assurance.